Samuel J. La Monte, M.D., F.A.C.S. (USPTF) recommend less routine testing ? 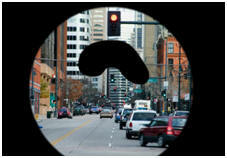 This might be what a patient can see with glaucoma. It usually starts as tunnel vision (peripheral visual loss) and then spreads to more central vision. You might think of it as opposite from the vision loss of macular degeneration. I will report on that disease in the coming months. 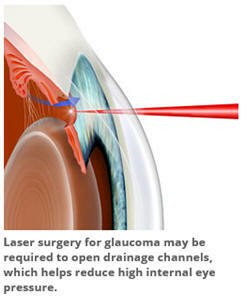 It should be known that Lasik surgery for near sightedness can increase your risk of glaucoma. Thinning the cornea, which Lasik surgery does to take out warping of the cornea, can create pressure readings that are not reliable in terms of safety for the optic nerve. This information should be discussed before having Lasik surgery. Sight is not something we can take for granted. 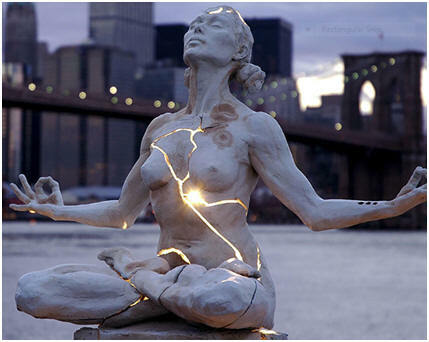 It is a gift, and when it taken from us, there is little else that can be more devastating. Research has taught us, there is a greater psychological impact to be deaf, but I think it depends on lifestyle, profession, and a host of other factors. And yet, a large percentage of people do not get their vision checked routinely. A considerable amount of vision can be lost until a person notices it, especially if it is in just one eye. The field of vision depends on 360 degrees, and one can lose vision in the periphery before it is noticed. This can be the case in glaucoma. The central vision is spared for a long time in glaucoma. The pressure in the eye is a vitally important aspect for good vision, and yet, without a professional eye exam, that pressure is not tested. Looking at an eye chart does not include a pressure test. This must be included in an eye exam. This test can be performed with an old fashion tonometer, but today, the pressure is tested with a gadget such as demonstrated below. With a slit lamp exam this type of pressure reading is used and is painless. 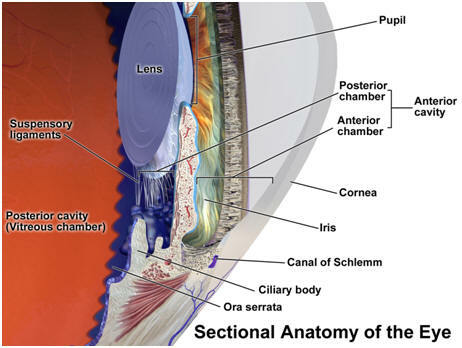 Think of the eye in 2 compartments: the front which includes the anterior and posterior chambers of the eye from the cornea to the back of the lens. 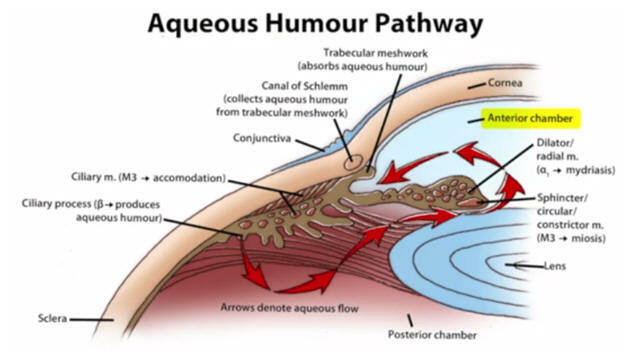 The front part is filled with fluid called the aqueous fluid(aqueous humor), a very watery fluid. The back part of the eye is filled with the vitreous body, which is filled with a jelly like fluid called the vitreous fluid(vitreous humor), which maintains the shape of the eye and includes the retina and the optic nerve disc. In the eye, as in a camera, there is an opening through which the light goes through (pupil) to the lens, which projects an image on the back of the camera (retina). 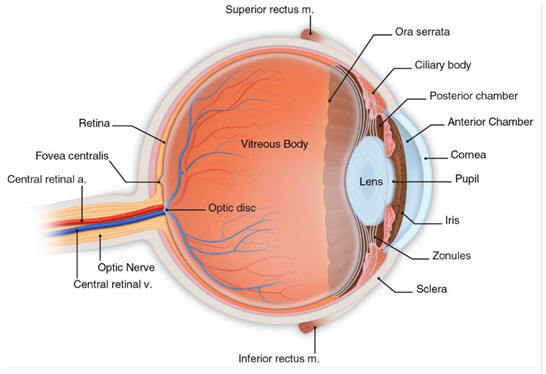 The retina sends the image to the brain via the optic nerve for interpretation. The optic nerve is very sensitive to the pressure on it produced by the internal pressure of the eye. Fluid in the anterior chamber flows to the posterior chamber through a tiny canal. It flows around the inner aspect of the iris to a critical angle where excess fluids exits to tiny veins and out of the eye chamber. To maintain normal pressure in the front of the eye, fluid must flow freely from chamber to chamber and into a canal (the canal of Schlemm), which drains excess eye fluid into a vein (episcleral vein) and into the circulation. Note this canal on the drawing of the anterior and posterior chamber. If this pathway is blocked in various ways, then pressure builds up and that can cause damage to the optic nerve. It is the basis for the disease glaucoma, which is really a group of diseases. 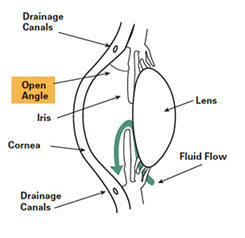 The pressure created in the eye depends on the natural flow of this fluid. Above a normal known pressure (12-22mm of mercury), there is additional pressure put on the system and on the optic nerve. With continued increased intraocular pressure, there is damage (cupping) to the opticnerve disc, which creates permanent vision loss if not correctable. It can occur suddenly (acute glaucoma). It is really not known how long it takes to create vision loss, and the pressure to create damage can be different depending on individual circumstances (thickness of the cornea, predisposition, etc.). 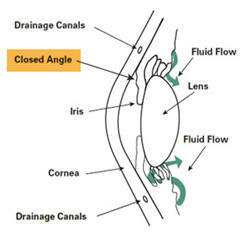 Below is a split diagram comparing the normal angle in a normal eye on the left side of the drawing and blockage of that angle on the right, which is the basis for angle closure glaucoma. This can occur over time or occur suddenly. For purposes of this report, in summary, there must be a normal amount of pressure maintained inside the eye for normal function. If the fluid is over-produced or the drainage in the front of the eye is blocked by excessive pressure, glaucoma occurs. The slit lamp exam allows the eye professional to view the internal anatomy of the eye, including the cornea, the conjunctiva (white of the eye), the iris (colored part of the eye), the pupil (which is the central opening in the iris), the lens, the fluid behind the lens, the retina, the blood vessels on the retina, and the optic nerve disc. 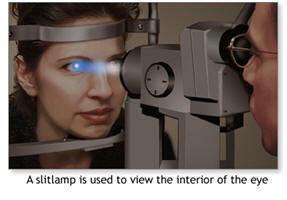 A visual field eye exam is necessary to test for any visual loss, especially the peripheral vision, and it will define the extent of visual field deficit in glaucoma patients (and other types of loss).A special machine flashes light at the periphery of your vision and thetechnician will ask you to press a button when you see the light. 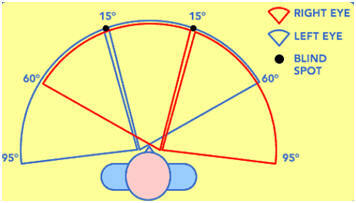 All 360 degrees of the visual field is tested and 95 degrees away from the center. This test will be abnormal in glaucoma patients. 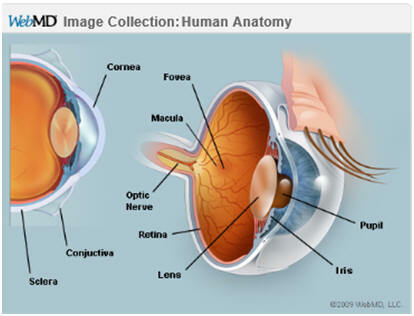 Click here to see the different types of Glaucoma. However, for our purposes, I will report on the most common types. It should be noted that there is a normal pressure (tension) glaucoma, which runs in families, Japanese, and those with cardiovascular disease. The cause is not known. Primary Open Angle Glaucoma affects 1% of the population. This is the most common, usually over the age of 50. There are no early symptoms of this type of glaucoma. As the fluid accumulates abnormally in the front of the eye (anterior chamber), it can make the chamber swell, and it can be measured as an increased intraocular pressure even though the angle between the cornea and iris have a normal angle as shown in the left drawing below. Contrast that a closed angle type of glaucoma (note the difference in size of the anterior chamber and the green arrows) seen in the right side of the drawing. 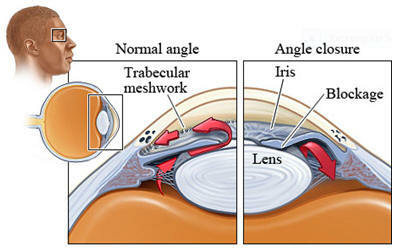 The loss of the angle between the cornea and iris prevents normal flow of fluid from the anterior to the posterior chamber. Study this drawing to gain knowledge about these two types of glaucoma. 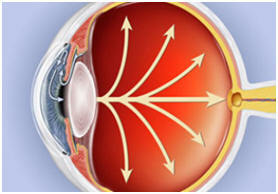 Glaucoma is all about maintaining normal range fluid pressure in the front of the eye (anterior and posterior chambers). Various causes can increase the pressure. The eye can make too much fluid or the fluid can be prevented from normally circulating in the eye and draining excessive fluid out of those eye veins either with normal angles or not. Ultimately, it is pressure on the optic nerve that causes visual impairment. Even when the vision starts to decrease in open angle glaucoma, it is so subtle many patients don’t realize it. This type is life-long.Left untreated, it will lead to blindness, and is irreversible from the beginning. The angle between the iris and the cornea is normal, however over time, the drainage system clogs increasing the pressure on the optic nerve in the back of the eye (diagram below) and creates permanent visual loss in certain areas of the visual field. 4 million Americans have this type of the glaucoma. It is more common in blacks. The diagram shows arrows in the front of the eye that forces pressure through to the back of the eye where the optic nerve connects the eye to the brain. This anatomical type is caused by blockage of the angle between the cornea and iris (as seen in the drawing on the previous page) because of increasing pressure. This can occur rapidly with noticeable symptoms (visual loss, headache, redness of the eye, and pressure behind the eye. This must be treated as an emergency with eye drops and or laser treatments. The cause is usually unknown, but could be caused by certain drugs. The initial treatment for glaucoma is topical eye drops (Xalatan, Timolol, Alphagan, etc.) to keep the canals clear and the pressure normal. There are many different drops that a glaucoma specialist can use, so if one stops working, another may help. There is also an oral medication that may help drop the pressure (acetazolamide-Diamox) and even reduce the production of fluid by the eye tissue (ciliary body). If that doesn’t reduce the pressure, there are very precise laser (Yag) procedures to clear out the drainage system. This is an office procedure performed under topical anesthesia, and may be repeated if the pressure re-elevates or the pressure does not go low enough. The hole created at the edge of the iris is above the lid margin, so it is not visible. There are several procedures that can be performed (iridotomy,trabeculotomy, shunts, implants, and even open surgery) but this is beyond the scope of this report. You can search using these keywords. Asthma and COPD drugs (Atrovent, Spiriva), meds for an overactive bladder (Detrol), GI reflux meds (Zantac, Tagamet), muscle spasm meds (Artane, Norflex), anti-depressants (Prozac, Paxil, tricyclics-Elavil, Tofranil), anxiety(Vistaril), cold medicine that contains ephedrine, corticosteroids, allergy meds(antihistamines and decongestants). If a person has glaucoma, always review their current medications and those to avoid. It should be noted that once the vision is lost, it is not usually possible to improve it with eye drops or laser procedures.The goal is to prevent further loss of vision. This type of work should be reserved for a glaucoma specialist. Subspecialty work in the eye requires fellowships for 1-2 years to become really proficient. WARNING! Glaucoma patients should not take certain medications such as antihistamines and decongestants without checking with their eye doctor. This information and subject is not easy to understand. 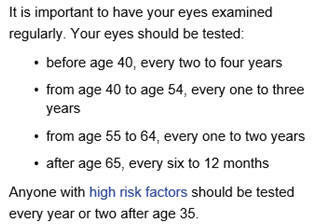 I highly recommend reading these references, and ask for handouts from your eye doctor. 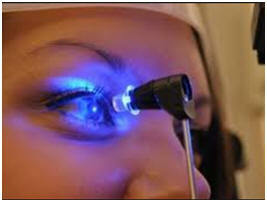 If you have glaucoma be sure you see a specialist trained in glaucoma. 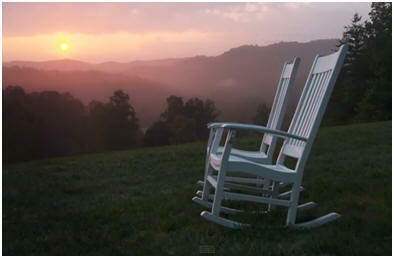 Don’t miss a sunset. Next month----macular degeneration! You are overweight, have high blood pressure, eat too much salt, don’t eat many fruits and vegetables, have not had an annual physical exam in years, did not schedule a mammogram in years or a Pap test, drink too much, still smoke, think you are “ bullet proof”, and have reckless behavior. You haven’t exercised in weeks. You know you should. In fact, you know all the right things to do to be healthy, but somehow you ignore them. Why? Are you stupid, too busy, have too much pain, rationalize your behavior, addicted, or feel you are too far gone? What are the factors that keep us from being motivated to do all the right things? I have read many articles trying to get a handle on this subject. Marketing research tells us that we have to want something and it has to be convenient to do it (plus have insurance). 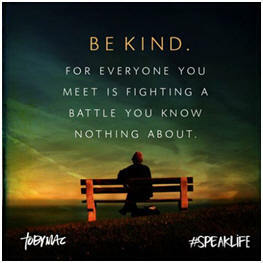 A lot of the bad behaviors are easy to overlook when we are hungry, had a rough day, “need a drink”, have tried diet programs with no long term benefit, or feel like a failure because we beat ourselves up for not being able to quit smoking cigarettes. Why do cancer patients still smoke? Why do alcoholics still drink, why do heart attack victims not lose weight or take their medicine regularly? Why do diabetics not check their blood sugar regularly? This is a sensitive subject for us all. It is hard to point the finger at someone when we are just as bad as others. Are you ridiculed by your family, bullied in school for your weight, depressed, have no self-esteem, or just feel like a failure and there is no use trying anymore? If you feel this way, you must get counselling before you attempt to get back on the straight and narrow. You can do it, but reach out for help. Be patient, don’t be afraid to fail, because it may take several attempts to be successful. The actual term is the alimentary tract and starts with the lips to the….. However, for purposes of this report, I will begin with esophagus. This report will discuss common issues of the esophagus, and symptoms that point to an esophageal issue. A quick look at the lower throat and the upper esophagus will help you understand why many patients come to see an ENT surgeon with symptoms in their throat. I saw these types of patients every day in my practice. The act of swallowing is an amazing anatomical feat. 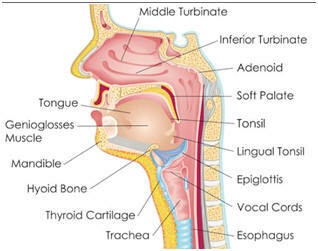 With swallowing the larynx (voice box) rises from the action of the tongue to prevent food or fluids from going into the lungs. The upper esophagus protects the throat and larynx with a sphincter muscle as it does in the lower esophagus (right before the stomach). These 2 sphincters at the top and bottom of the esophagus: the upper sphincter keeps contents of the esophagus from regurgitating back into the throat and being aspirated and the lower sphincter keeps stomach contents from leaking into the esophagus. Normal swallowing requires coordination between the esophageal movement and relaxation of the sphincters to allow food and fluid to pass easily into the stomach. Symptoms: Laryngitis, a raspy voice, sore throat, difficulty swallowing, ora sensation of a lump in the throat are all common symptoms that these patients experience. Regurgitation of stomach contents when lying down at night, belching, and even erosion of the surfaces of the teeth can occur with chronic reflux (leakage). Heartburn, chest pain, even serious enough to think a person is having a heart attack can be serious. The esophageal and throat linings are not equip to tolerate acid from the stomach, much less your teeth. Another consequence of chronic aspiration can be asthmatic bronchitis from silent leakage into the lungs. This would aggravate any pre-existing lung trouble.The upper airway must be protected from the acid, bile, and food in the stomach. 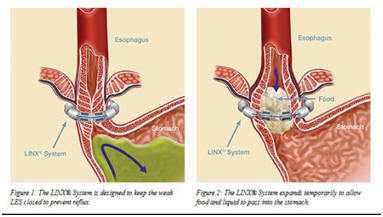 Anyone with lung disease needs a thorough evaluation of the esophagus. GERD affects millions of Americans and when you consider the increased weight of the average person in America, this is a major health issue that is increasing. The drawing shows that upper sphincter. The muscles of the esophagus “milk” (peristalsis) the food down to the stomach. With a thorough nasal, throat, and laryngeal exam that is normal, there is a high likelihood that reflux is the problem. Allergic postnasal drip is also very common and may be a secondary issue. Many of these patients will not complain of gastric discomfort. With an upper gastrointestinal barium swallow (upper GI series) or an endoscopic exam of the esophagus, reflux can be seen. A hiatal hernia or other abnormalities can be seen, such as esophagitis, tumors, congenital abnormalities (diverticulum), strictures, etc. Reflux occurs with an incompetent sphincter from a hiatal hernia (a small part of the stomach herniates through the diaphragm as seen in the drawing). 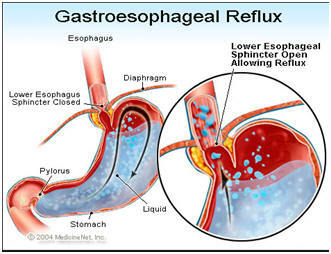 Even partial paralysis of the stomach movement (gastroparesis) can lead to reflux. The major causes are cited. The medical treatment of reflux has been nicely covered in a previous report. There are treatments for resistant cases. Banding is a last resort but can be effective in the hands of an experienced surgeon. This can be placed endoscopically. Repairing a hiatal hernia can be performed through open abdominal surgery but is now more commonly performed endoscopically. The diaphragm must be tightened with sutures, and the hernia is pulled back into the abdomen and sutured around the esophagus as seen in the above photos. 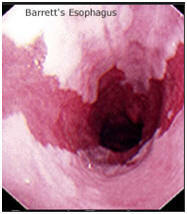 Another issue that is not terribly uncommon is difficulty with motility (movement) of the esophagus. That means the muscles of the esophagus do not work correctly. The normal action of the smooth muscles of the esophagus is called peristalsis (and this goes for the entire intestinal tract). There are diseases that cause this peristaltic abnormality, such as achalasia. This disease can affect the smooth muscles of the esophagus and /or the sphincters. The sphincters do not relax, therefore, food does not pass normally, and food gets stuck (this can happen with persistent GERD from strictures). 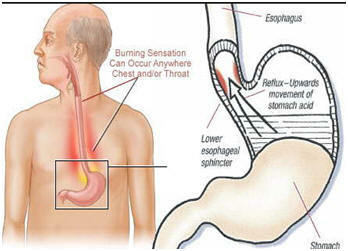 An esophageal pressure test can diagnose this disease. Damage to the nerves is the cause, and certain immunologic diseases such as scleroderma, diabetes, and certain neurological diseases should be ruled out. In many cases, the cause can’t be identified. These patients complain of cough, regurgitation, chest pain, and difficulty swallowing as any disease of the esophagus can. 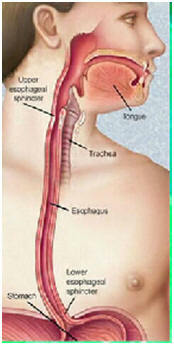 With achalasia, there is reduced muscular activity in the esophagus but increased tension in the sphincters. Treatment includes Botox injections of the gastro-esophageal sphincter, which will relax the muscle. This lasts a few months. Surgery (Heller myotomy) to partially cut the muscle or dilation may be helpful as well. Nitrates and calcium channel blockers (anti-hypertensive) may help as well. About one third of these patients will learn to manage their problem and do well without treatment. Below there are 3 images of the gastro esophageal junction-1) normal 2) reflux esophagitis is caused by acid and bile re-entering the esophagus and burning the lining 3) Barrett’s esophagus is a very important potentially pre-cancerous condition that is caused by chronic reflux. This is diagnosed during endoscopy. A biopsy can diagnose Barrett’s. 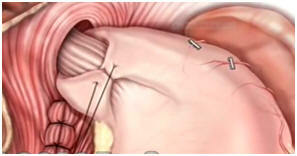 Endoscopic sleeve removal of the lining of that part of the lower esophagus can be performed. Of course, treatment of reflux is mandatory. Careful monitoring of these patients is critical as a small percentage of these patients will go on and develop esophageal cancer. Sucking down bottles of Tums is not a good idea. There is a lot calcium in them and predispose to kidney stones. The rule is: if over the counter anti-acid medications don’t relieve symptoms of reflux in 2 weeks, consult your doctor. There are autoimmune diseases that can cause esophageal problems such as lupus, Bechet’s, scleroderma, dermatomyositis, diabetes, and any neuro-muscular disordershould be ruled out with testing. All of the autoimmune disorders are caused by vasculitis causing nerve damage. 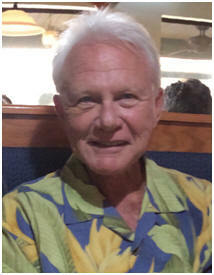 Next month, I will report on esophageal cancer, which is on the rise. Don’t miss the discussion. 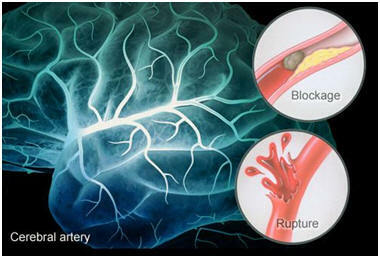 Two types of stroke occur-ischemic from a blood clot (85%) and hemorrhagic from a ruptured vessel (15%) (usually an aneurysm or complication from meds such as anti-coagulants). 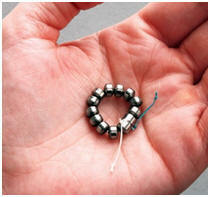 The well-known treatment for a stroke is a clot buster! (t-PA--tissue plasminogen activator in the first 3-4 hours after the onset of symptoms will result improved survival and better return of the results of a stroke. It should be noted that not all strokes require t-PA and a hemorrhagic stroke will be made worse with this injection. It is critical to get to a certified stroke center for the best and fastest evaluation of a stroke. Strokes caused by a blood clot (ischemic) are the type that will respond to have the clot dissolved fast enough to prevent brain death in the region of the clot. 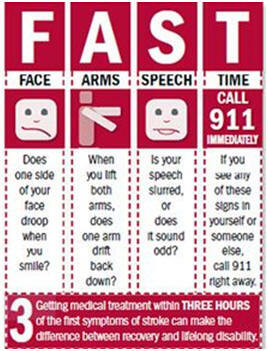 Always remember the word FAST to test someone for signs of a stroke! Face-arms-speech-time! In 2013, research came out doubting the value of physically removing a clot from a stroke patient, however, more recent studies from major stroke centers have changed the thinking and have proven that with removal as much as 15-20% greater improvement in returning neurological symptoms and signs can be anticipated. A very recent study in the New England Journal of Medicine reported that t-PA plus clot removal with a retriever was superior to tissue plasminogen alone. It should be noted that only 10% of stroke patients require this endovascular procedure. It is the position, character of the clot, and amount of brain tissue damage that determines the candidacy for clot removal with a retriever. The rate of restoring blood flow with a retriever was 88% effective. In fact, the study comparing thrombectomy plus t-PA (60% of the patients) vs. t-PA alone (30%) was so successful, that the study was stopped. This was at 90 days post-treatment. These patients could also have retrieval of the clot as much as 6 hours after the stroke. In fact, another study in the same medical journal performed thrombectomies up to 8 hours. To be a candidate these patients had to have a clot in the internal carotid or middle cerebral arteries. The CT scans had to show only smaller areas of brain damage. Another study just out this month reported a drop in the time of the stroke to treatment by 90 minutes using an MRI instead of a CT scan. As one can see, these studies are evolving right before our eyes as more and more stroke centers are opening. MRIs are being frequently placed very near the emergency departments. It is critical to have very experienced doctors performing these thrombectomies. All stroke victims are not candidates for this procedure, so it will require a critical workup to know this. As of this report, there were 39 centers in the above study throughout the country. With this information, it is becoming very important to be transferred to a high level stroke center where the most experienced doctors are located. You will witness more centers opening because of the business it will bring that hospital. It is still vital that the time from diagnosis to treatment is less than 4 hours and preferably 3 hours if t-PA is used alone, but it appears you have up to 6-8 hours to get to a stroke center that can perform thrombectomies. This includes dialing 911 ASAP, getting to the emergency department, being evaluated including a scan to rule out a hemorrhagic stroke, and set up an operating room for the procedure to be performed and have the clot buster administered. It would be prudent to research where the closest stroke center is located to you and your family. Also, TIAs (transient ischemic attacks) also warrant urgent attention, because of the significant chance of a stroke in the future. There are now certified comprehensive stroke centers and primary stroke centers. Rapid transfer to a comprehensive stroke center is the preferred move. The FAST sign remids everyone what to check for when you suspect someone is having a stroke. Maybe they just suddenly stopped talking, or have a blank stare on their face. Maybe they just fell. Ask them to do these classic signs for a stroke and call 911. The only comprehensive stroke center in North Georgia is St. Mary’s Hospital in Athens, Georgia. Emory and Grady Hospitals are comprehensive centers in Atlanta and there is one in Augusta, Georgia. The Northeast Georgia Heart Center in Gainesville, Ga. is a primary stroke center. Remember, any primary stroke center can evaluate you for the possibility of needing a stent retriever thrombectomy and will be able to evaluate you for administering t-PA. There are many websites available for more information on stroke. WebMD, the American Stroke Association, The American Stroke Foundation, and centers like the Mayo Clinic. Next month, carotid artery stents!! 5. Why does the Federal Government (USPTF) recommend less Health Screening for the general public? My opinon! I try to give unbiased information in my reports. However, enough is enough. I am all for healthcare reform, but every time I read that the USPTF (United States Prevention Task Force) has come out announcing that the general public does not need health screenings, I have to ask why. It is simple. The Feds are trying to encourage doctors not to routinely test for disease unless you are high risk. DOES EVERYONE HAVE SYMPTOMS THAT PUT US IN A HIGH RISK CATEGORY? 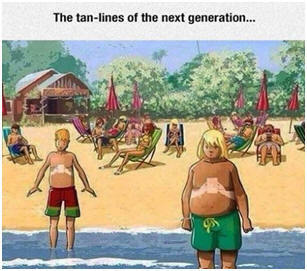 Does everyone know their risk factors? NO! Many diseases masquerade as innocent signs and symptoms or the symptoms are so slow showing up that we are not aware of them. Even if a healthcare professional gives us a 3 page form to fill out, it never includes all aspects of our health. The nurse or doctor asks you what is bothering you. You may not realize that you have relatives with diseases, or know that you have a lump in your breast. With the minimal time a doctor spends with you these days, it must be focused on the chief complaint (as it should be). Screening is just that……finding problems the doctor and the patient does not know about. The reason for all these recommendations is also because of the potential harm it can cause. Unnecessary biopsy, surgery, worry, and complications from the unnecessary explorations are the reasons I read in the medical literature. But they only know it was unnecessary after the fact. In the end, YOU AND YOUR DOCTOR have to decide what is right for you based on family history, previous medical issues, etc. You must be knowledgeable about these issues to make an informed decision. The latest announcement from the USPTF states that routine testing of the general public does not need testing for type 2 diabetes mellitus. Are these folks looking at the epidemic of diabetes and obesity in this country, even in children? Under Obamacare and federal guidelines, insurance companies have to follow their directions. For instance, The USPTF just announced that women 50-74 should only get a mammogram every other year and they don’t recommend any routine screenings before 50. So, if you decide with your doctor that you need one every year, you may be paying for it. The American Cancer Society cancer screening workgroup, of which I am a member, will come out with new guidelines for mammography, which are more expansive, this fall. Healthcare reform does not mean just reducing the cost. They must stop Medicare fraud ($1 in $10 spent is fraudulent), over-testing by some doctors, hospitals gouging insurance companies, and Medicare patients going to the doctor for every little problem. There is great room for improvement, and when our Congress can come together and work on this, I think we may see progress. With a polarized Congress, these issues become one side or the other, and the issue doesn’t get a fair shake. I am not criticizing the ACA (Affordable Care Act), because there have been many aspects of the act that has sent us in the right direction. Affordable, it is not. Cost containing it is not. Cost shifting it is! You read that healthcare costs are dropping. It is not because of Obamacare, it is because of the recession, and with so many out of work, they can’t afford to go to the doctor. That is a fact. Also hospitals and doctors started cutting costs long before Obamacare. As a physician, I know that the feds can’t tell me what to do………………..but when (not if) we go to federal healthcare, will they dictate to the doctors as they are now making suggestions and recommendations to not test, to improve the quality of care, to select patients more carefully for procedures, etc. ? They are already not paying for re-admission for complications from a hospitalization, and they are penalizing doctors for poor outcomes. Patient surveys determine the payment to a hospital and doctor. That is not all bad, but people tend to be much more negative about an experience than positive. I am making the case for YOU to continue to be the CEO of your own healthcare, and if you need something checked or tested, I suggest you work this out with your doctor, and never allow any outside force from dictating guidelines that suddenly become rules. This transformation is happening…..from recommendations to rules!! The lawyers are going to love it! Medicine is not “cookbook”. After 5 years of Obamacare, it was hoped that 35 million Americans would be insured, but that has been downgraded to 27 million. There are still 32 million uninsured. And yet, more Americans do not want Obamacare. Why....because they don’t trust the government. With all the negative publicity we see about the government, it becomes difficult to trust them. Do you? Florida healthcare premiums for midrange health insurance have on the average increased 20%,(Associated Press), especially if you did not stay on your previous health plans. Soon, I will report on some good solutions to reform healthcare. Studies have shown that most Americans do not care about income inequality and most of these healthcare issues subjects…..right or wrong. (Associate Press). We must compromise on these issues. The cancer screening guidelines can be found at these websites. As this table shows, the rates of desirable screening are not being met. This is my opinion based on research, and you are welcome to email me if you have comments, and I have a blog on my website as well.